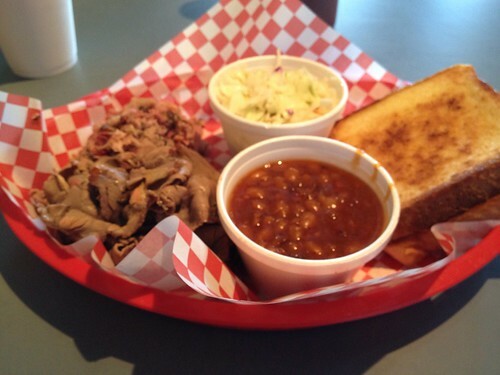 It's been awhile since I found and reviewed a new BBQ joint. However, this past weekend I had some time to kill and I was in an area that I don't often visit. So, I plugged "BBQ" into Google Maps on my iPhone and found out that I was only a couple of miles from Country BBQ. I followed the guidance directions and pretty soon, I'd located Country BBQ. It's a small place that you'd miss if you weren't looking for it, but that's usually where you find the best BBQ. So I found a spot to park, stepped to the counter, ordered, and grabbed one of the dozen or so tables in the place. I ordered the 2-meat plate. Sliced beef and pulled pork, along with sides of cole slow and BBQ beans. They did have sweet tea (the mark of any good BBQ joint), but I skipped it as I'm watching the extra calories and cutting them out where I can. The food came out quick enough and I was impressed by the generous portions. Definitely a good value. The cole slaw was kind of a cross between a vinegar and creamy based slaw, but it was very good. The BBQ beans were okay, but there was a flavor there that I couldn't put my finger on and frankly didn't care for all that much. When I ordered "sliced beef", I assumed that would be brisket. Disappointingly, it was closer to a shaved roast beef and not very "bbq like". However, the pulled pork was very good. It was finely chopped, but I really enjoyed the flavor. There were 3 kinds of sauce on the table. I chose the "regular" sauce and while it was thin, I thought it was very good. I did not try the mustard sauce or the other sauce that appeared to be a thick KC style sauce. Two giant slabs of Texas toast rounded out the meal. If you find yourself in the area, give this place a shot. I don't think you'll be disappointed. If you have a BBQ'er on your Christmas list this year, there are any number of specialty shops online that can help you find that something special. Myself, I buy a lot of BBQ sauces, seasonings, gadgets, etc. Here are the places that I shop and a few of the products that I recommend for the BBQ aficionado on your Christmas list. BBQ Pro Shop - a great online retailer of all manner of BBQ related items. You'll find a great selection of sauces, rubs, smoking woods, BBQ tools, and even BBQ pits. One of my favorites. Fred's Music and BBQ - Fred's place is an extensive online store that is complimented by a retail store in Schillington, PA. A wide variety of products including Fred's own line of rubs and sauces are available both online and in person. Great Lakes BBQ Supply Company - Another fine online retailer and member of the BBQ community. Here you'll find more boutique rubs and sauces. Excellent products all, just not the stuff you're likely to find on supermarket shelves. Thermapen - this instant read, splash proof, thermometer is the Cadillac of instant read thermometers. It's well worth the money and something that any BBQ'er who's researched it has to have. Blues Hog BBQ Sauce - This has become my go to rib sauce. I love it and those that have eaten my ribs with it, love it too. Plowboys Yardbird Rub - a good all purpose rub that has become a staple in my cabinet. I use it on lots of things. 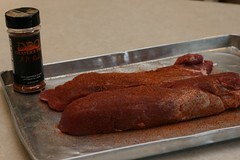 Peg Leg Porker Sauce & Rub - I've enjoyed this rub and recently the sauce. 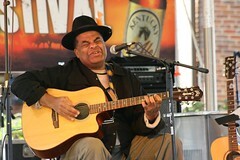 If you're looking for a Memphis style flavor profile, check this one out. Drapers BBQ - This one is new to me, but I really like it. Draper's A.P. Rub & Smokin' Sauce are a great combination and I've enjoyed cooking with these products since I recently discovered them. So get moving. There's still time to score that unique item for your BBQ fanatic. The look on his or her face on Christmas morning will be worth it! I love the "microbrew" movement in BBQ sauces and rubs. 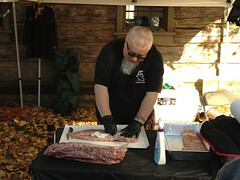 It has created many new products and companies that share the love of good BBQ with a passion to make a great product. Shane Draper at Draper's BBQ is one of those folks who is sharing his passion and family traditions via his own "microbrew" BBQ sauce and rub. Shane is a 3rd generation pitmaster from Western Kentucky and as the label states, there's "3 generations of pride and flavor in a bottle" that honors his family hertiage. While I had met Shane on line awhile back, it was only recently that I actually got to chat with him a little at the Kentucky Bluegrass festival where he was sharing samples of his products. I came home with a bottle of both the A.P. Rub and the Smokin' Sauce. I'd planned to cook with these products righ away, but a little knife accident sidelined me for a couple of weeks. 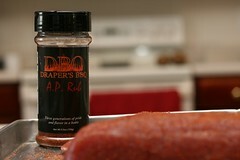 I finally had the opportunity to fire up the grill and try out Draper's rub & sauce. 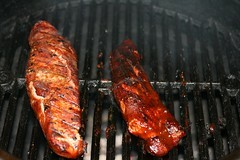 I like to sample rubs and sauces with pork tenderloin or chicken. I think flavors stand out a little more with these meats. So, we had a couple of pork tenderloins ready to go for dinner last night. I applied the A.P. Rub to both and grilled them on the Bubba Keg. When they were nearly done, I gave one of them a coat of Smokin' Sauce as a finish. Then, I sliced them and the family sat down to dinner. 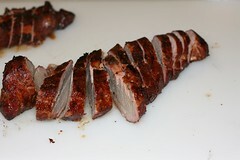 Now usually, my wife and I like a finish sauce on pork tenderloin, but my kids prefer them dry. The Smokin' Sauce definitely changed that. Much to my surprise, the kids couldn't get enough of the sauced tenderloin. In fact, one of my daughters said, "I can't eat any more, but can I lick the sauce off that last piece?" Now if that's not an endorsement, I don't know what is! In all seriousness, Smokin' Sauce is a tomato based sauce with a slightly sweet finish and just a little kick. Don't think "Kansas City" when I say sweet, cause that's not what I'm talking about. This is more Memphis than KC, but I'd even hesitate to put it in the category of Memphis style sauces. I have also tried the sauce on brisket and for me, I'd have to say that I prefered it on pork. But it was a good compliment to both. The A.P. Rub is a really nice balance of salt, spice, and sweet. In fact Shane was sampling the product sprinkled on popcorn in Danville, KY. I found it just a little sweeter than the rubs I've been using most often. That's probably what makes it more all purpose than rubs targeted at a specific meat. For comparison, I'd definitely put it in the cateogry of a Dizzy Pig or Yardbird type of rub. Truly, it's an all-purpose (or A.P.) rub. I'm very happy with the products and I'll continue to cook with them. I'm also anxious to try the other sauces that Shane's working on. 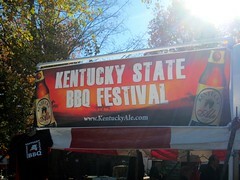 Artifacts from the Kentucky State BBQ Festival are still popping up even 2 weeks after the event. This video surfaced today. If you look closely, you'll find yours truly picking the guitar along with my good friend Dave and some of the Peg Leg Porkers crew at the :20 second mark. Last week, I mentioned that I'd cooked for a military exercise at Scott Air Force Base. 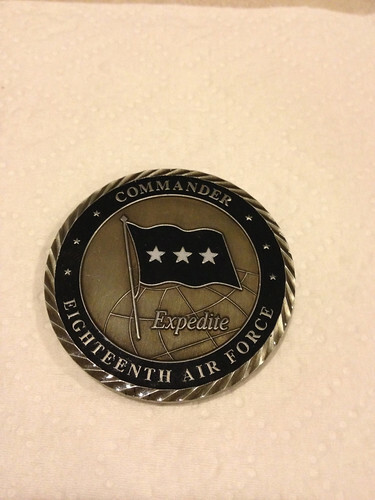 Well, the 3-Star General sent a token of his appreciation. 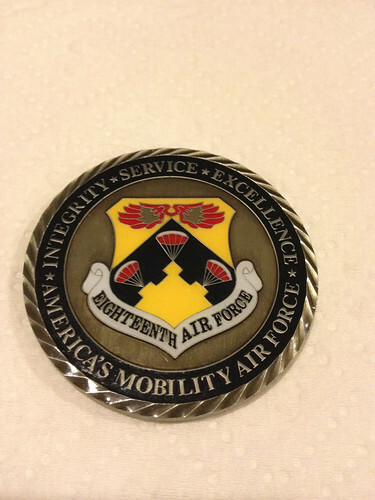 This is his "challenge coin", presented to his staff and members of the exercise as an award for outstanding achievement. I'm honored to have been recognized. 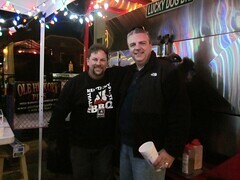 Oh, and next year he's challenged me to cook ribs & brisket. I'm happy to oblige.